Black women still have a disproportionately higher breast cancer death rate - 41% higher than white women. This finding is based on 2005 to 2009 data, showing that even though African-American women have a lower incidence of breast cancer, they are more likely to die of this disease than women in any other racial or ethnic group. Once a woman receives abnormal mammography results, it takes longer for her to get a diagnosis if she's black than if she's white, studies have shown. 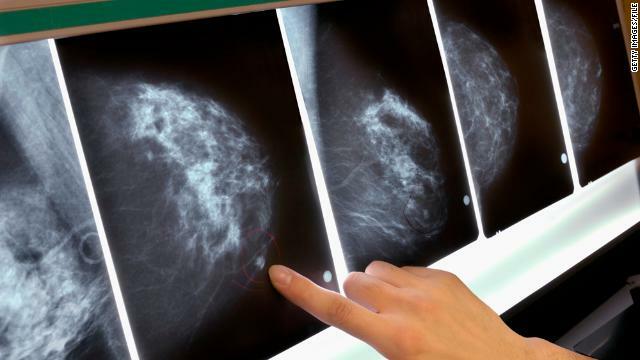 The report also points out that black women more commonly have subtypes of tumors that are harder to treat, especially a kind called triple negative breast cancer. "Further research is needed to determine the etiology of biological characteristics of breast cancer in black women to design effective prevention and treatment strategies," the report said. This report also points out that African-American women still aren't receiving the same quality of breast cancer treatment as white women typically do. White women are also more likely to begin treatment within 30 days of diagnosis. If women of both races received the same treatment, death rates could fall by almost 20%, Dr. Marcus Plescia, Director of the Division of Cancer Prevention and Control at CDC, told reporters Wednesday. The Affordable Care Act is designed to allow access to health care that wasn't possible for some women before, including mammograms, said Ileana Arias, principal deputy director for the CDC. This report does have some limitations that it acknowledges: The study did not verify cause of death. Race and ethnicity could have been misclassified, and the population estimates from the U.S. Census Bureau may have errors. Breast cancer is the second leading cause of cancer death in the United States, and leads to about 40,000 deaths annually among all women. In general, more research is needed to probe the reasons for such racial disparities and develop interventions that benefit all groups. More aggressive breast cancer types also require more research in terms of screening and treating them. I am so angry right now, I am currently fighting one of the rare breast cancer Inflammatory Breast Cancer, and I asked my onc the question that your article speaks of "If women of both races received the same treatment, will my diagnosis change," I was told I would still die because I am Black. How can you make such statements regarding black women and breast cancer and then come back and make your disclaimers. I am going to die from all reports I have read and every doctor, cancer organization, every researcher because of every thing under the sun even to black women not owning computers. Is this a money thing or what? I would love and will speak to these people. Where are they getting their stats from? Are they just making this up to get paid. Fighting4thetatas: My sister battled stage 4 IBC six years ago and she is still cancer free. UNC told her she was the only cancer patient there that wasn't anemic. Two years ago I battled Triple Negative Cancer (I'm NOT black or hispanic). So.... give yourself a fighting chance to BEAT YOUR IBC. How? See someone trained in boosting your immune system via accupuncture (needles or via pressure). My sister and I are both needle-phobic, so we saw a highly recommended chiropractor who was trained in this skill. When I told my sister that my Duke oncologist said to me "ALL our cancer patients are anemic at some point, except you. Whatever you're doing – don't stop" – she told me that UNC said the very same thing to her. Two different, highly praised cancer treatment hospitals, said the same thing to her and to me. (I too have been cancer free for a year now). So I told the chiropractor and he told me WHY. He said "your blood needs to be oxygenated in order to best carry nutrients (and the chemo) through your body. You oxygenate your blood when you exercise, which is something you don't have the strength to do when fighting cancer. When I boost your immune system, I'm oxygenating your blood. THAT's why you and your sister never battled anemia and why you both did so much better from the treatments." So, get YOUR immune system boosted (my sister and I went weekly during our chemo treatments). We also had several powerful prayer groups praying for us and that makes a big difference too. Thank you Lou so much for your reply. I will take your advice and will post to let you and the world know how it went. Its amazing how the things that we never thought could help, are the very things that does. This is a good informative article for black women. Coming from a family that has a history of breast cancer, I know the effect it has and it has scared. I'm a Junior in college and I religiously do self breast exams and take precautionary actions. I do believe EVERYONE young, old, black,white,Indian,Hispanic should take preventative measures and get check ups. Trust me cancer does not care about your race or age. I think not only race is an issue, I think a lot of woman are discriminated based on their age as well. I am 27 and they found my lumps when I was 26. It has taken me over a year to get into any doctor, not because of my race but because of my age, and the fact that I can't afford my employers insurance ($536 in 2012). As a single mother and having sole custody of my two boys ages 3 and 7 how can treatment not be a concern? I find it sad that doctors are more worried about the money aspect rather than the patient in it all. Isn't this "Good" news for the GOP? I was just diagnosed on Nov 10,2012, triple negative. I am a 50 year old African American. My team of doctors have put me thru more tests than I could have imagine, MRI, PET Scan, EKG, various blood work and other tests. I feel that I am getting the best care possible. I am stage 1, my tumor was 1.6cm. I found the tumor myself and my OB/GYN had me take a mammogram (which I do every year) and a sonogram. I had a lumpectomy on 1/10/13., my lymph nodes and margin were free of cancer. I have to get 4 treatments of chemo and six weeks of radiation. Do your research and ask lots of questions, breast cancer.org is a very helpful site. Don't be afraid to ask questions and always get a second opinion. Why is everything about Blacks VS Whites,, their shouldn't be a chart.... I really don't believe, when you have cancer, your thinking,,, how many Black, White, Asians, Hispanic or anyone else is going through this.